Porsche Cayman S Brembo Brakes! 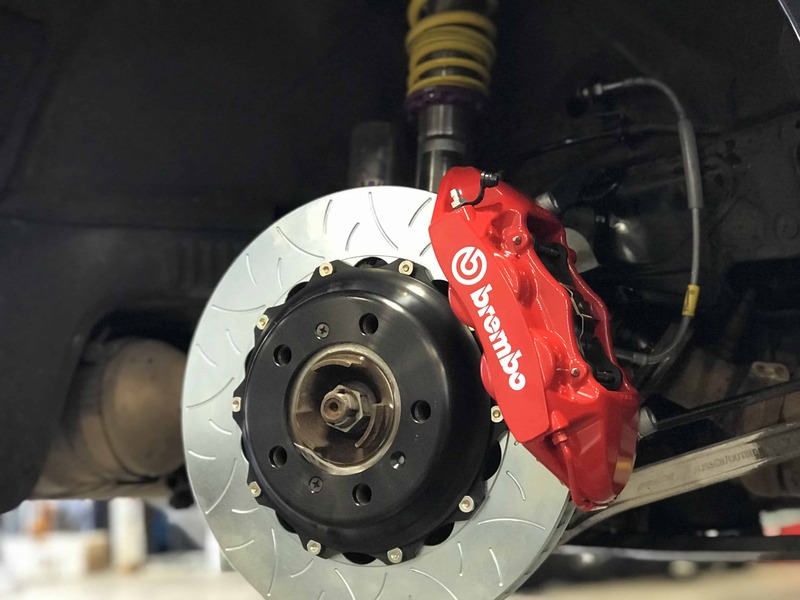 Porsche Cayman S Brembo Brakes big brake kit is perfect if you need more stopping power, and have the space to fit them inside your rims. 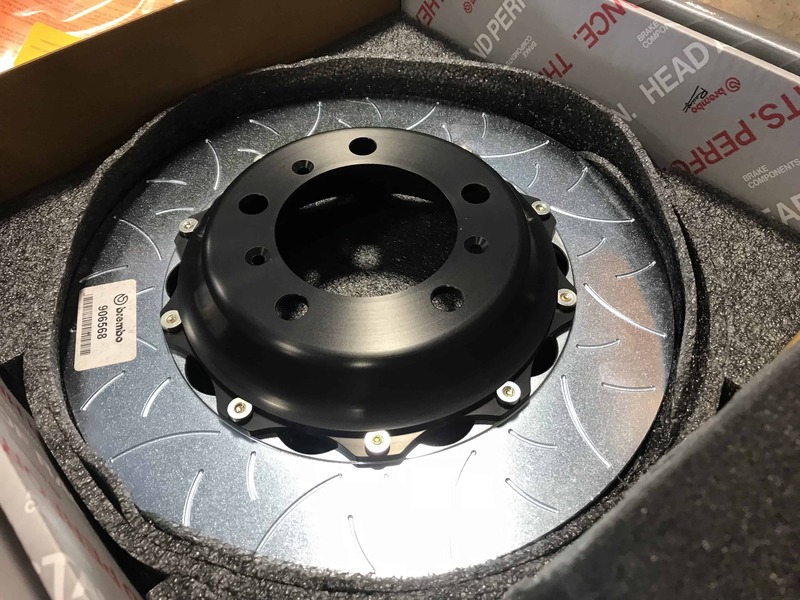 The larger rotors give you more surface area and make it easier to stop, without compromising the driveability and comfort features of an OE system. 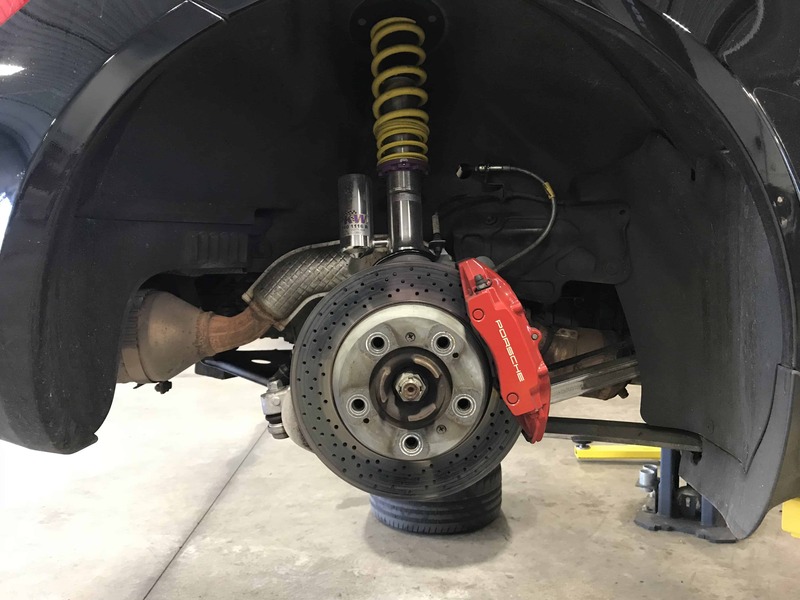 Porsche Cayman S Brembo Brakes kit is a straightforward install and designed to work seamlessly with your vehicle’s stock master cylinder, ABS, and traction control system. However, some familiarity with braking systems helps ensure a longevity and reliability of the new components. 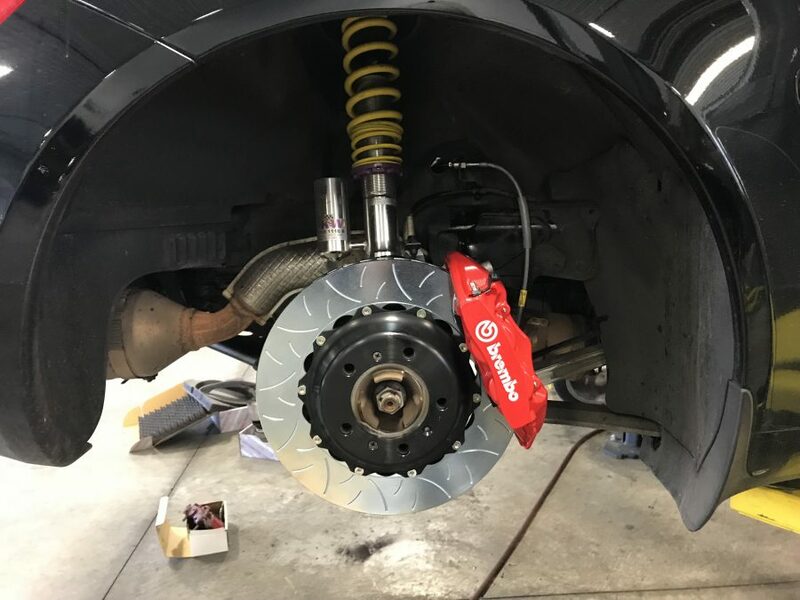 We’re no stranger to brake upgrades, so the customer of this 987 Cayman S was looking for us to help get this Porsche Cayman S Brembo Brakes kit installed and working on his vehicle. The first step is the removal of the old calipers and rotors. Whenever taking off the calipers, care has to be taken not to introduce air into the brake fluid circuit, as doing so can necessitate a longer, more involved bleeding on completion. Once the calipers are off the vehicle, the new parts are test fit. When doing the rear, it’s also a good time to check and see if the emergency brake needs replacement. Installation is basically the reverse of the uninstallation. The Caliper mounting brackets are designed vehicle and system specific, so be sure of left right orientation and fitment before proceeding. After the caliper bracket fitment is verified, we can inspect the 2-Piece Disc rotors. By manufacturing the center section out of precision milled billet aluminum, a great deal of weight can be saved in this key location. This reduces both unsprung and rotating weight which benefits handling, acceleration overall vehicle dynamics. These rotors were slotted, so they benefit by having more “bite” due to the slotted edge that wipes the pad clean every time the pedal is pressed. With the rotors in place, the calipers are installed. 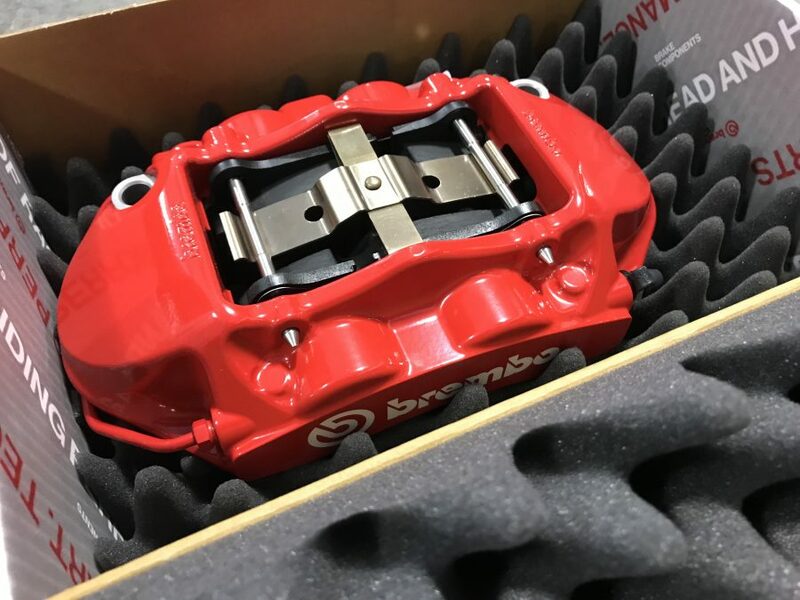 Brembo calipers undergo a strict homologation process which exceeds the requirements set by OEM manufacturers however, the calipers should be fully disassembled and greased at all the critical lubrication points to ensure noise-free operation. We also do additional chamfering of the brake pad surfaces any time we install a race grade pad. This ensures that aggressive pads have manufacturing edges removed before the bedding process, thus ensuring quiet street operation. Lastly is the installation of stainless steel brake lines. Goodridge High Performance brake lines are constructed of a PTFE inner hose covered by braided stainless steel. 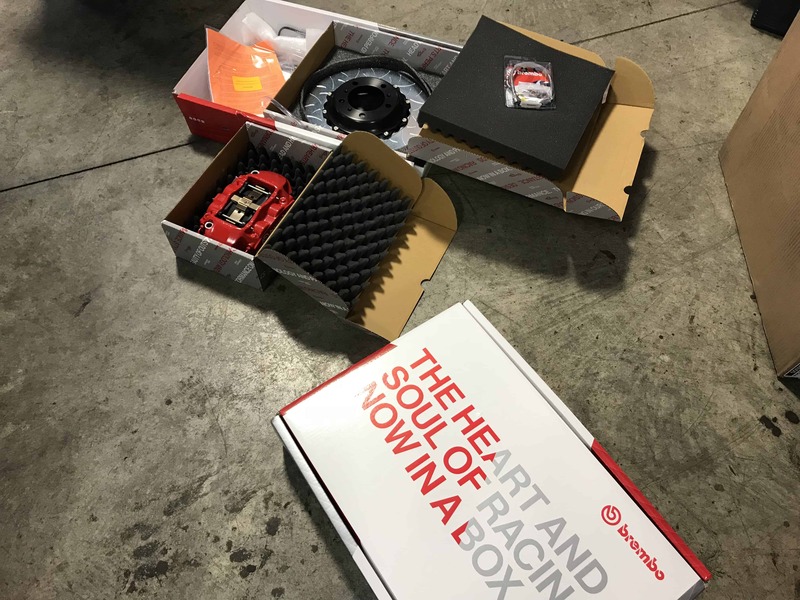 They eliminate the “spongy” feel that often accompanies stock rubber brake lines so you can be assured that every inch of pressure from the pedal is transferred directly to where it counts – the caliper. In addition to providing a more responsive and firm brake pedal, High-Performance Brakelines are abrasion and corrosion resistant to stay good looking for a long time to come. Are you looking for a Big Brake Kit for your Car? 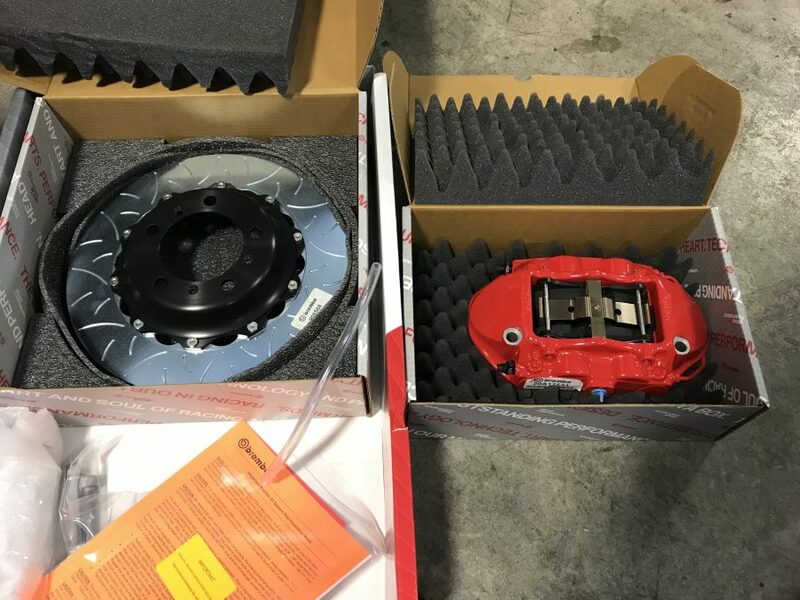 Whether it’s a Porsche, BMW, Mercedes or any other vehicle, we can answer all your questions if you’re looking to upgrade your brakes. Just stop by our Naperville Location that located off of the I88 Rt 59 Aurora exit, or call (630) 913 9604.